1. Ole Miss after a gut punch of Old Testament proportions. Trailing 35-31 with just over 90 seconds remaining, Ole Miss faced a 3rd-and-3 from the Auburn 20-yard line. A brilliant play call and great execution gave Laquon Treadwell the ball on a screen pass as he ripped through the secondary and headed for the goal line. What seemed like a sure touchdown (and was ruled as such initially) and a probable win was erased in a blink of an eye, as Treadwell was tackled from behind, badly injuring his ankle and losing the football in the process. Auburn’s Cassanova McKinzy hopped on the loose ball, and Ole Miss lost one its best players, the game, and a realistic shot at the SEC championship in less than one second. Ole Miss enjoyed perhaps the season’s most exhilarating win in beating Alabama 23-17, and now has suffered the season’s most devastating loss. 2. You have to feel good for Will Muschamp today. After the way his team has invented ways to lose over the past two seasons, the run of scoring 31 consecutive points en route to a 38-20 win over Georgia had to feel unbelievably good. 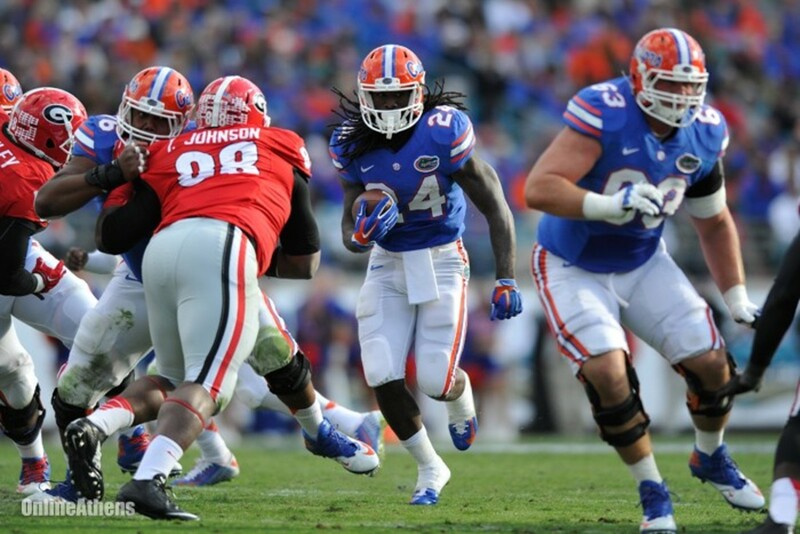 The Gators threw six passes for 27 yards, and rushed 60 times for 418 yards and five touchdowns. 3. Let’s go live to Gary Pinkel for his reaction to the Florida-Georgia score. Georgia’s loss gives Missouri, a team that lost at home to Indiana, sole possession of first place in the SEC East with three games remaining. The Tigers close with road games at Texas A&M and Tennessee, and then host Arkansas on Thanksgiving Saturday. For a team that hasn’t scored more than 24 offensive points in SEC play, I can see them going 3-0 just as easily as I can see them going 0-3. 4. Speaking of Indiana… The season hasn’t gone as Kevin Wilson had hoped, but the Hooisers do have college football’s best looking play card. If the goal of these things are to draw attention from the real action, this definitely accomplishes that. 5. Todd Berry’s team gave a winning effort in College Station. ULM didn’t play like a team that had lost three straight games, walking into Kyle Field and out-gaining Texas A&M 347-243 and holding the Aggies scoreless in the second half in a 21-16 loss. I could tell you about how ULM’s ball-control offense sucked the air out of the stadium, or I could show you. 6. Coaches Getting It Done in Year Two: P.J. Fleck. Western Michigan pounded Miami (Ohio) 42-10 on Saturday, improving to 6-3 this season after going 1-11 a year ago. 7. Coaches Getting It Done in Year Two, Part II: Matt Rhule. After starting 1-10, Rhule is now 6-3 in his last nine (and 5-3 this year) after stunning East Carolina 23-10 in Philly. The Owls were out-gained 428-135, but won the turnover battle 5-0. Temple has now held its opponent to 10 points or less four times in eight games. 8. Coaches Getting It Done in Year Two, Part III: Skip Holtz. After a 4-8 debut, Louisiana Tech is 6-3 and 5-0 in conference play, putting itself in the driver’s seat to meet Marshall for the Conference USA title after routing Western Kentucky 59-10. 9. Coaches Getting It Done in Year Two, Part IV: Sonny Dykes. After looking at times like a culture clash in a 1-11 debut, Dykes has Cal at 5-4 with games against USC, Stanford and limping BYU to close the year. Considering the way they lost to Arizona and UCLA, these Bears could easily be 7-2. 10. Coaches Getting It Done in Year Two, Part V: Steve Addazio. His bunch of dudes are 6-3 after beating Virginia Tech 33-31, improving from 7-6 last season on the back of Heisman finalist Andre Williams. Here are the rushing yardage differentials in BC’s six wins: 338-55, 452-20, 413-16, 310-43, 202-19 and 258-69. Average difference: 295-37. Cumulative difference: 1,771-222. 12. East Carolina’s loss throws the Group of Five race into chaos. East Carolina was the clear-cut favorite for the Group of Five’s Playoff bowl spot until the loss to Temple. Considering the committee’s disdain for Marshall’s schedule, I’d consider 8-1 Colorado State to be the front-runner, but you have to win your conference to win the spot. With that in mind, I’d take Boise State as the de facto leader until they suffer a loss. 13. South Carolina did it again. The Gamecocks led 42-28 with under five minutes to go, and lost 45-42 in overtime. They’ve now dropped three games when leading by 13 or more in the fourth quarter, and are 2-5 in SEC play. For Steve Spurrier’s (ultra-brief) thoughts on the game, click here. 14. Can TCU and West Virginia play every week? Since mutually joining the Big 12 in 2012, the road teams has won all three games, and all three have been thrillers. TCU beat West Virginia 39-39 in double overtime in 2012, and West Virginia answered with a 30-27 overtime win in Fort Worth last season. TCU rallied from deficits of 13-0, 27-14 and 30-21 to beat West Virginia 31-30 on a field goal as time expired on Saturday, keeping their Big 12 and Playoff hopes alive.
.@TCUFootball is now tied for 2nd nationally with 6 road wins over AP Top-25 teams since 2009. Horned Frogs are 6-3 in that stretch. 15. It didn’t receive the attention of the last two meetings, but Oregon pounded Stanford something nasty. The Ducks hit the nation’s top-ranked total and yards per play defense and second-ranked scoring defense for 525 yards, 6.8 yards per play and 30 first downs in a 45-16 win. 16. Duke moved one step closer to appearing in back-to-back ACC Championship games. DUKE! The Blue Devisl are 7-1 despite allowing 594 yards, 358 rushing, in a 51-48 double-overtime win over Pittsburgh. The Duke football team is 15-1 in its last 16 regular-season games. Duke. Football. 15-1. Amazing. 17. Miami may have figured it out. Al Golden’s Hurricanes have scored 55, 30 and 47 points in their current three-game winning streak. The ‘Canes are off next week before hosting Florida State in a game that is much more interesting now than it looked a month ago. We can’t say they didn’t get any help, though. #goacc RT @ByTimReynolds: So in the span of 20 seconds, we had a bad punt snap safety, a free kick, a defensive TD and a missed PAT. 18. Maryland won the game, but lost the war. The Terps rallied from a 16-7 deficit to beat Penn State 20-19, its second win over the Nittany Lions in 38 tries. But they had to do it while overcoming a self-inflicted wound after this display of immaturity. Randy Edsall said he had no idea his players had that trick up their sleeves; Maryland AD Kevin Anderson called Penn State AD Sandy Barbour to apologize. 19. Arkansas continues to do everything needed to win football games, except win football games. After grabbing defeat from the jaws of victory against Texas A&M and Alabama, Arkansas built a 10-0 lead at Mississippi State, and then allowed the Bulldogs to score 17 unanswered points while the Razorbacks missed a field goal, suffered a turnover on downs on a 4th-and-goal from the three-yard line and threw an interception in the end zone. Hindsight is obviously worth the paper it’s printed on, but my math tells me three points in each situation adds up to an Arkansas win. The Razorbacks out-rushed the Bulldogs by half a yard per carry and won the turnover battle 3-0 before Brandon Allen’s last-gasp heave, but it still wasn’t enough. Eventually, it will be. 20. While you were sleeping, UCLA has won three in a row. It won’t be everything it was built up to be this offseason, but the Bruins are now 7-2 with winnable games against Washington, USC and Stanford remaining. A 10-win regular season would be the program’s first since 1998. 21. Arizona State is probably going to win the Pac-12 South again. The Sun Devils blew a 13-3 lead but rallied to beat Utah 19-16 in overtime, taking sole possession of the divisional race and joining Oregon as the conference’s loss one-loss survivors. Notre Dame comes to Sun Devil Stadium next week in a massive game for both teams.